The Tulsa Civic Center Historic District has exceptional significance to the City of Tulsa because a unified governmental civic center was a long-held dream whose development plans began in the 1920’s, continued through the 1930’s, 1940’s and 1950’s, and was finally fully executed in 1969. The process that planned the center and use of Mid-Century Modern architecture received national and international recognition. The Tulsa Civic Center Historic District also fulfilled the city’s desire to create a governmental center intended to inspire Tulsa residents to use the downtown and investors to seek out the city. This historic district is an extraordinary collection of Mid-Century Modern buildings all constructed within a fourteen-year period, planned as a group in a unique urban environment, near or on a public plaza; the district is out of the ordinary for a city setting. These buildings, the Tulsa County Courts and Offices (1955), Convention Center (1961), Tulsa City-County Library (1965), Page Belcher Federal building (1967), Tulsa Police Courts (1969), Francis Campbell Council Room (1969), and the City Hall Tower (1969), share characteristics of Mid-Century Modern buildings. They have flat roofs, minimal ornamentation, they are basic box construction and express their caged structure, or they are built for volume with an exterior applied “skin”, or curtain wall. They use concrete and steel as primary construction materials along with prefabricated “industrial” or pre-fabricated parts. In Tulsa, they are the last city/county/federal buildings constructed specifically as the architectural embodiment of government in monumental civic buildings. Planning for a new Civic Center began in Tulsa in 1924 with the “Tulsa Plan.” A civic center was to be located near Union Station (then in planning) incorporating the most convenient transportation at the time – the railroad. The center proposed access to the station and to a plaza of formal classical buildings, symmetrically designed with elaborate gardens and a large obelisk. From the 1920s to the 1950s, with each successive Civic Center plan architects suggested the use of the popular architecture of the time because they believed it had the ability to convey the significance of government in an up-to-date appearance. In 1924 it was imposing classical style; in 1930 the architecture was more streamlined Art Deco and subdued classical, but still with formal gardens, water features and a public plaza. In 1943, another plan was proposed and included city and county courts and an auditorium and plaza. A 1953 plan was proposed, but not delineated visually. Tulsa architects formed an Architectural League and worked together in a Gropius-idealized planning process to create the Civic Center plan which the city officially adopted in 1955. For their adopted plan, the Architectural League received a national AIA award — the Citation of Excellence in Community Architecture — one of the organization’s highest awards. The group’s planning process was also featured in Architectural Forum in 1956. The Architectural League’s Civic Center plan was mentioned in a 1958 book, Architecktur und Gemeinshaft: Tagebuch einer Entwicklung , as one of the world’s foremost architectural projects, “only one of twenty-three top architectural achievements in the world during the past century.” That astounding claim comments specifically on the proposed collection of Modern Movement Civic Center buildings proposed by the Architectural League. The proposed Modern Movement architectural styles of Civic Center buildings received world-wide attention, and helped create Tulsa’s image as modern and progressive. The city had purchased existing buildings at the Civic Center site beginning in 1952. It was a neighborhood mostly of houses from the early 1900s, but the buildings removed also included apartments, church, bakery and a few stores. To include all the proposed Civic Center buildings, the City Commission revised the Civic Center plan in 1964 by adding four more blocks to the original eight within the Civic Center boundaries. The extra land was needed for construction of the Page Belcher Federal Building and Post Office. 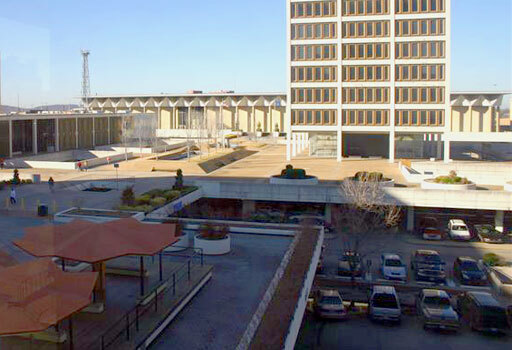 The Tulsa Civic Center Historic District retains its distinctive qualities of design, setting, and massing that distinguish it as a unique setting in Tulsa’s downtown. The size and placement of the buildings near or on the public plaza has not changed. The buildings are in good condition with original windows and all but the City Hall Tower and Francis Campbell Council Room (vacated by the city government in 2007) are still used as governmental or civic buildings. Those two buildings are now privately owned. The city-owned Convention Center remains heavily used for conventions, entertainment and merchandise shows. The Civic Center Historic District was listed in the National Register of Historic Places on January 3, 2012 under Category G, Exceptional Significance, Criteria A and C for community planning. Its NRIS number is 11000641.